Candace Campana is climbing the ladder in her singing career. 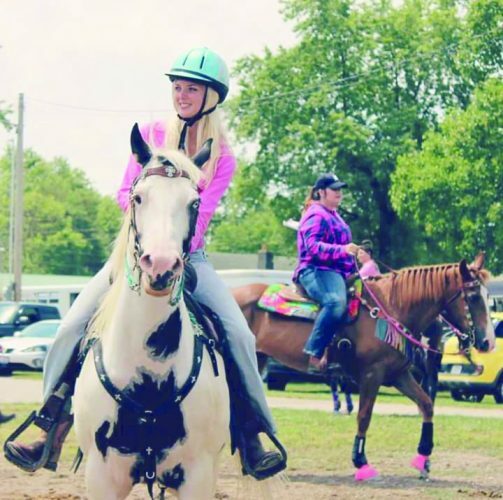 This year, the Youngstown State University alumna was asked to sing the National Anthem for the Cleveland Indians and at the Equine Affaire show in Columbus. Candace Campana said the Equine Affaire show celebrates the horse, and hundreds of thousands of people attend. She said a lot of quarter horses are featured in the show, horses are for sale and different exhibits are on display. Candace Campana said the event is something that she has always gone to, but she never thought that she would be asked to perform at it, which is a huge deal to her. Candace Campana said she kept going to the barn specifically to see this horse and found out more about him, and his owner had starved him, he was abused and passed along from home to home. In regard to her upcoming performance of the National Anthem for the Indians, Candace Campana said she loves representing YSU. She said last year, YSU President Jim Tressel threw the first pitch when she got the opportunity to sing for the Indians. Candace Campana said the hope of someone hearing her sing for the Indians and deciding that she needs a record is always on her mind. She said celebrities can be in attendance, and she never knows who is going to hear her sing. Candace Campana said she wants to take her singing career as far as she can go, and she is always looking for people to perform with. Candace Campana submitted to sing at the Pittsburgh Pride festival in June. She said they have been writing back with her, and they seem very positive that she will be getting a time slot. Dalton Campana, Candace Campana’s brother, said she has always been passionate about singing ever since she was young, and he has always followed her career path. He said it’s always been entertainment, singing, modeling and acting for his sister. Dalton Campana said he is supportive of anything his sister does, and he will do anything in his power to help her.